The first outcome of the December 2016 workshop on apps, platforms, and portals for citizen science projects was the open access paper “Defining principles for mobile apps and platforms development in citizen science“, which came out in October 2017. 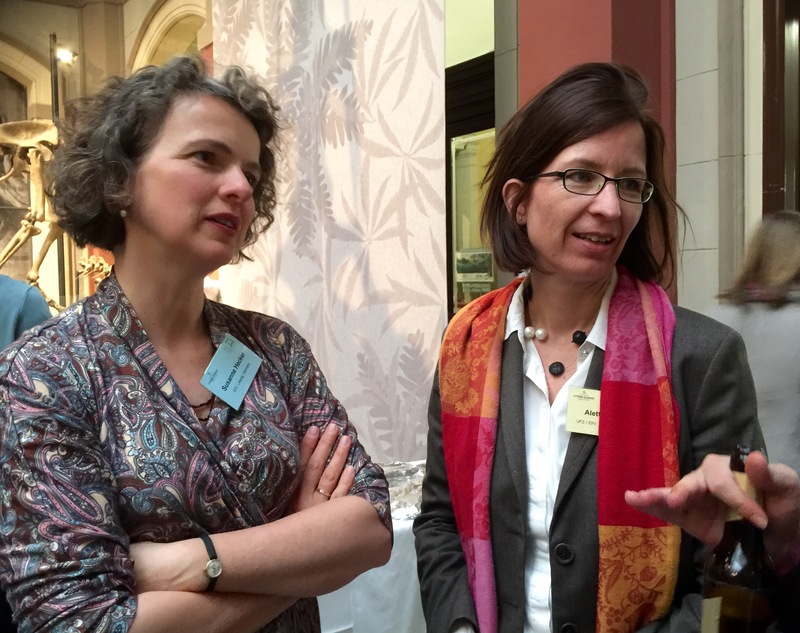 The workshop, which was organised by Soledad Luna and Ulrike Sturm from the Berlin Museum for Natural History, has led to a second output – a chapter in the book Multimedia Tools and Applications for Environmental & Biodiversity Informatics. The invitation for contributions came at the right time with the first workshop in December 2016. The Chapter was completed in August 2017 and finally came out at the beginning of the month. A year from submission to getting it in press, which is fairly common in academic publications. The chapter is different from the journal article, in providing more detailed examples of applications, and summarising aspects of systems in use and data standards that can be applied. The chapter can be accessed using the following link Luna et al 2018 Developing mobile applications for citizen science – enjoy reading! From time to time, there are opportunities to become a co-author with a lot of people that you are very happy to be associated with – to demonstrate a shared piece of work that represents a common understanding. 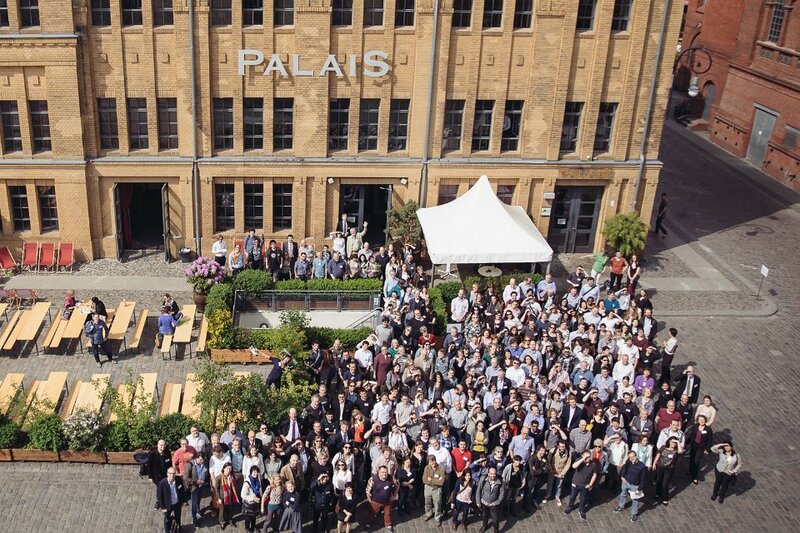 The participation in the first European Citizen Science Association conference in 2016 created such an opportunity, with a paper that was written by a core group of people from the organising committee and keynote speakers. The paper “Innovation in Citizen Science – Perspectives on Science-Policy Advances” is a report of the issues that were covered in the conference and the lessons and recommendations that emerge from it. The list of authors is impressive: Susanne Hecker , Rick Bonney, Muki Haklay, Franz Hölker, Heribert Hofer, Claudia Goebel, Margaret Gold, Zen Makuch, Marisa Ponti, Anett Richter, Lucy Robinson, Jose Rubio Iglesias, Roger Owen, Taru Peltola, Andrea Sforzi, Jennifer Shirk, Johannes Vogel, Katrin Vohland, Thorsten Witt, and Aletta Bonn. 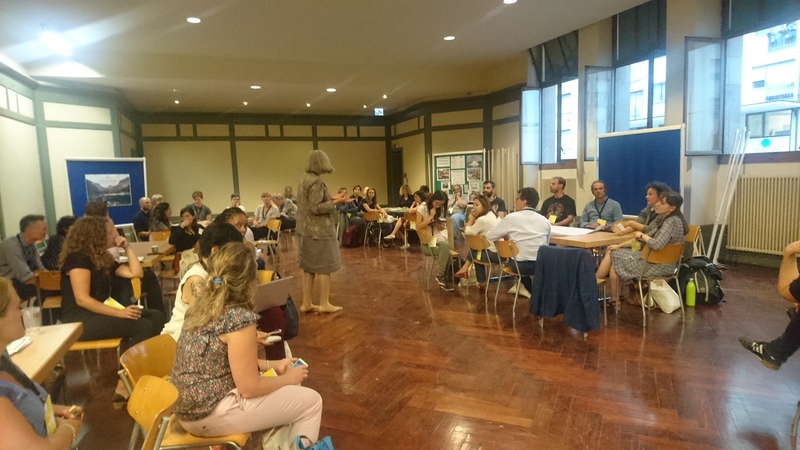 The writing was led by Susanne Hecker (Helmholtz Centre for Environmental Research UFZ / German Centre for Integrative Biodiversity Research (iDiv) Halle-Jena-Leipzig) and also led to an innovation in the journal “Citizen Science: Theory and Practice” by creating the space to report meetings. There is a long tradition in science of producing meeting’s reports, and there is an assumption that this is now obsolete in the age of blogs – but this paper provides the demonstration that this is incorrect. First, the paper provides a clearer and well-structured statement of the event and its outcomes. Unlike blogs, it is appearing two years after the event, but this also means that the content needs to stand the test of time and point to the long-term outcomes from the event. Secondly, the longer period of editing and the process of peer review made the paper a better record of the event. In the inaugural ECSA conference, we are exploring the intersection of innovation, open science, policy and society and the ways in which we can established new collaborations for a common good. The terms participation and inclusion are especially important if we want to fulfil the high expectations from citizen science, as a harbinger of open science. In the talk, the conditions for participatory citizen science will be explored – the potential audience of different areas and activities of citizen science, and the theoretical frameworks, methodologies and techniques that can be used to make citizen science more participatory. The challenges of participation include designing projects and activities that fit with participants’ daily life and practices, their interests, skills, as well as the resources that they have, self-believes and more. 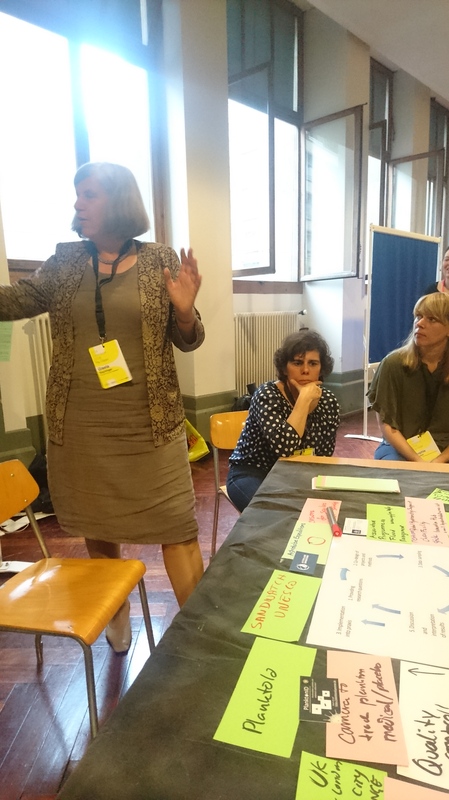 Using lessons from EU FP7 projects such as EveryAware, Citizen Cyberlab, and UK EPSRC projects Extreme Citizen Science, and Street Mobility, the boundaries of participatory citizen science will be charted. After opening with acknowledgement to the people who work with us (and funded us), the talk turn the core issue – the term participation. Type ‘participation’ into Google Scholar, and the top paper, with over 11,000 citations, is Sherry Rubin Arnstein’s ‘A ladder of citizen participation’. In her ladder, Sherry offered 8 levels of participation – from manipulation to citizen control. Her focus was on political power and the ability of the people who are impacted by the decisions to participate and influence them. Knowingly simplified, the ladder focus on political power relationships, and it might be this simple presentation and structure that explains its lasting influence. These ladders come with baggage: a strong value judgement that the top is good, and the bottom is minimal (in the version above) or worse (in Arnstein’s version). The WeGovNow! Project is part of the range of ongoing activities of using digital tools to increase participation and move between rungs in these concept of participation, with an inherent assumption about the importance of high engagement. At the beginning of 2011, I found myself creating a ladder of my own. Influenced by the ladders that I learned from, the ‘levels of citizen science’ make an implicit value judgement in which ‘extreme’ at the top is better than crowdsourcing. 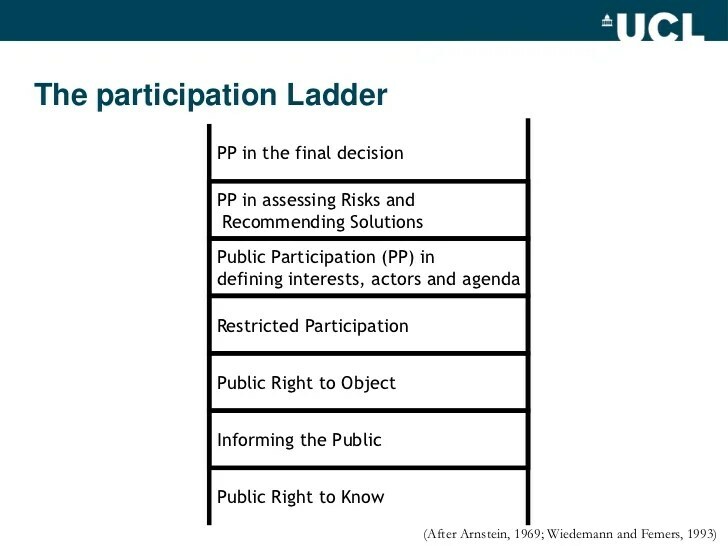 However, the more I’ve learned about citizen science, and had time to reflect on what participation mean and who should participate and how, I feel that this strong value judgement is wrong and a simple ladder can’t capture the nature of participation in Citizen Science. There are two characteristics that demonstrate the complexity of participation particularly well: the levels of education of participants in citizen science activities, and the way participation inequality (AKA 90-9-1 rule) shape the time and effort investment of participants in citizen science activities. We can look at them in turns, by examining citizen science projects against the general population. We start with levels of education – Across the EU28 countries, we are now approaching 27% of the population with tertiary education (university). There is wide variability, with the UK at 37.6%, France at 30.4%, Germany 23.8%, Italy 15.5%, and Romania 15%. This is part of a global trend – with about 200 million students studying in tertiary education across the world, of which about 2.5 million (about 1.25%) studying to a doctoral level. However, if we look at citizen science project, we see a different picture: in OpenStreetMap, 78% of participants hold tertiary education, with 8% holding doctoral level degrees. In Galaxy Zoo, 65% of participants with tertiary education and 10% with doctoral level degrees. In Transcribe Bentham (TB), 97% of participants have tertiary education and 24% hold doctoral level degrees. What we see here is much more participation with people with higher degrees – well above their expected rate in the general population. The second aspect, Participation inequality, have been observed in OpenStreetMap volunteer mapping activities, iSpot – in both the community of those who capture information and those that help classify the species, and even in an offline conservation volunteering activities of the Trust for Conservation Volunteers. In short, it is very persistent aspect of citizen science activities. low skills/high engagement: Such activities are providing an opportunity for education, awareness raising, increased science capital, and other skills. They require support and facilitation but can show high potential for inclusiveness. In short – in each type of project, there are important societal benefits for participation, and it’s not only the ‘full inclusion at the deep level’ that we should focus on. Interestingly, across these projects and levels, people are motivated by science as a joint human activity of creating knowledge that is shared. So what can we say about participation in citizen science – well, it’s complex. There are cases where the effort is exploited, and we should guard against that, but outside these cases, the rest is much more complex picture. The talk move on to suggest a model of allowing people to adjust their participation in citizen science through an ‘escalator’ that we are aiming to conceptually develop in DITOs. Finally, with this understanding of participation, we can understand better the link to open science, open access and the need of participants to potentially analyse the information. Following the ECSA meeting, the Data & tools working group workshop was dedicated to progressing the agenda on data & infrastructure. Jaume Piera (chair, Data and Tools working group of ECSA) covered the area of citizen science data – moving from ideas, to particular solutions, to global proposals – from separate platforms (iNaturalist, iSpot, GBIF, eBird) but the creation of different citizen science associations and the evolution of ideas for interoperability, can allow us to consider the ‘Internet of People# which is about participatory sharing of data. We can work in similar way to standards development in the area of the internet, and starting to consider the layers: interoperability, privacy/security, data reliability, infrastructure sustainability, data management, intellectual property rights, engagement, Human-Computer Interaction, Reference models and testing. By considering these multiple layers, we can develop a roadmap for development and consider a range of solutions at different ‘layers’. The idea is to open it to other communities – and aim to have solutions that are discussed globally. Arne Berra explained the CITI-SENSE platform. There is a paper that explains the architecture of CITI-SENSE on the project site. 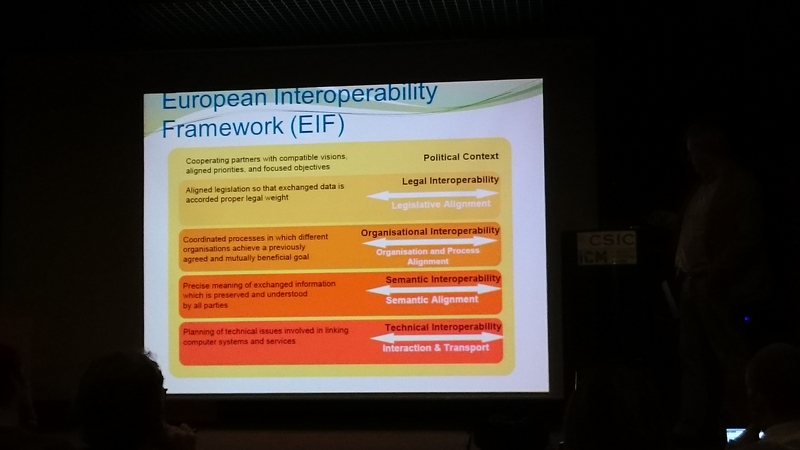 He proposed that we use the European Interoperability Framework — legal, organisational, semantic and technical. in the technical area, we can use ISO 19119 and OGC – with 6 areas: boundary, processing/analytics, data/model management, communication, systems. We can use reference models. Also suggested considering the INSPIRE life cycle model. There is a challenge of adapting standards into the context of citizen science, so in many ways we need to look at it as conceptual framework to consider the different issues and consider points about the issues. In CITI-SENSE they developed a life cycle that looked at human sensor data services, as well as the hardware sensor application platform. 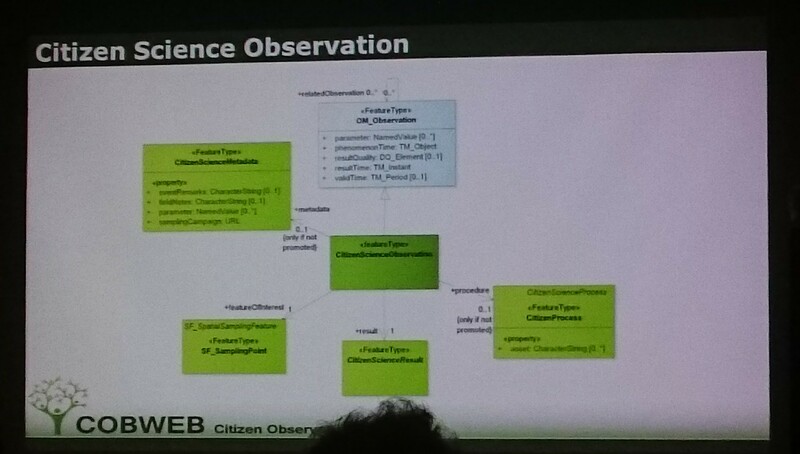 Ingo Simonis (OGC) – a standardised encoding to exchange citizen science data. He describe work that OGC is doing in sensor web for citizen science, and they collected data from different projects. Through citizen science data, information come from different surveys, in different forms and structures. The requirements are to have citizens + environment + sensor. Who did particular measurement? We want to know about the environment – e.g. that it was rainy while they collected the data, and then know about the sensor. So OGC O&M citizen observatories model is conceptual. It’s an observation model – assigning a value to a property – they also look at standards for sensors – OGC SensorML. He used the ISO 19100 series of standards. The observation model is trying to address issues of observations that are happening offline and then being shared. The model also deal with stationary and mobile sensing activities, and allowing for flexibility – for example having ad-hoc record that is not following specific process. Alex Steblin – The Citclops project includes applications such as Eye on Water (eyeonwater.org). The Citclops have a challenge of maintaining the project’s data once the project finished. Veljo Runnel covered EU BON work (www.eubon.eu) – mobilising biodiversity ata is challenges. They want a registry of online tools for citizen science projects – tool that will allow people who work with citizen science to record information about the project as related to biodiversity – such as link to GBIF, recording DNA, use of mobile app. Finding the person that run the tool is difficult. On EU BON they have ‘data mobilization helpdesk’, the elements of the standard were discussed within the the EU BON consortium and how they are going to explore how to provide further input. JRC is exploring the possibility of providing infrastructure for citizen science data – both metadata and the data itself. Translation of technical information into a language that is accessible is valuable for the people who will be using it. We need to find ways to make information more accessible and digestible. The aim is to start developing reference material and building on existing experiences – sub divide the working group to specific area. There are many sub communities that are not represented within the data groups (and in ECSA) and we need to reach out to different communities and have including more groups. There are also issues about linking the US activities, and activities from the small-scale (neighbourhoods) to large organisations. As we work through information, we need to be careful about technical language, and we need to be able to share information in an accessible way.